Leaflets are now coming through doors across Coventry for our three Trade Unionist and Socialist Coalition (TUSC) general election candidates – Judy Griffiths, Nicky Downes and Dave Nellist. If you are visiting this site after reading it, welcome! We encourage you to get involved with our campaign in any way you can – whether it be by talking to your friends, family and workmates about why you they should vote TUSC, leafleting your street, knocking doors. putting up a window poster or donating a few pennies or pounds to our funds. We would also encourage you to consider talking the step of joining the Socialist Party. Help us build a movement to put an end to capitalist austerity and to build support for a socialist system that puts the needs of ordinary people before profit. For more information about TUSC please watch the clip of Dave Nellist at the bottom of this page. If you are want to help our campaign or to join us, please fill in the form below! Geoffrey Robinson to stand down? 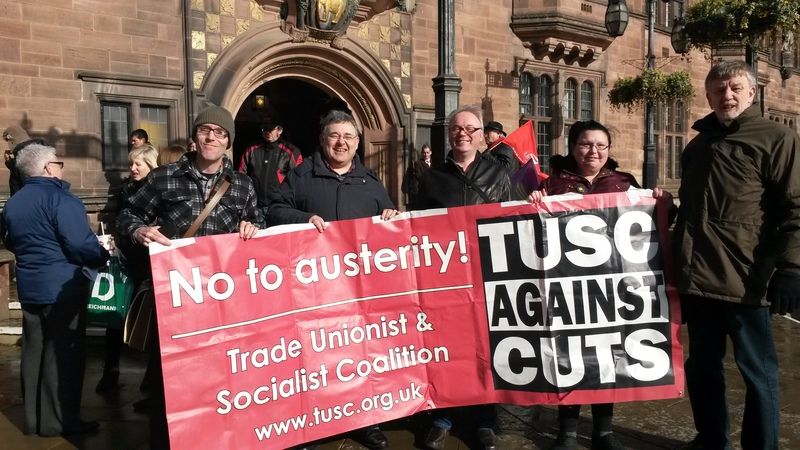 Watch the making of the TUSC election broadcast!